She sees him playing guitar, busking on the streets of Dublin and strikes up a conversation. I that instant, they both know that there is something special between them. She takes him to a nearby music shop. He plays her his songs. She accompanies him on the piano. They share a beautiful moment that neither wants to end. I have to admit something to you - I have a problem with people bursting into song on film. Sometimes it works for me, sometimes it just plain doesn’t - and on those occasions, I want to curl up into a ball and make it go away. However, Once works - it is pure magic from start to finish. This film was shot in just 17 days for pennies (relatively speaking) and it is a perfect example of how the musical format can feel completely natural. 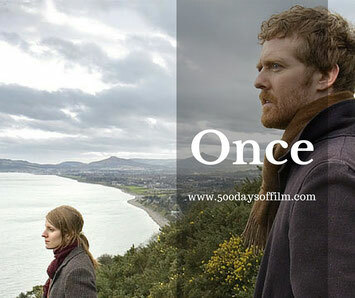 Once’s story is simple and yet so full of deep, complex emotion. Broken musical boy meets quirky musical girl. They talk, play music and life begins to feel better. I fell in love with this film and both of its central characters within about the first five minutes. The boy and the girl (we never know their names) are superbly played by Glen Hassard and Marketa Irglova. They are inherently good, very funny and are both phenomenally talented musicians. The music in this film is just beautiful and utterly authentic. I could have listened to Hassard and Irglova all day. I mean, they could have spent the entire film in that music shop and this movie would still have felt perfect. However, in addition to the superb music, there is a great and surprising story here. Hassard’s character is coming to terms with a lost love. Irglova has recently arrived from the Czech Republic and is trying to build a new life in Dublin. Both are struggling. Both find an escape in music and in each other. As the film progressed, I started to wonder how it would end. It needed a special ending, I felt. I desperately wanted a happy one. But I also didn’t want it to sell out - at that moment I’d have preferred no ending at all to that option. I needn’t have worried. Once has an ending that is both surprising and in all ways just perfect. Hansard and Irglová composed and performed all of the original songs in the film. Hansard and Irglová's song "Falling Slowly" won the 2007 Academy Award for Best Original Song and the soundtrack as a whole also received a Grammy Award nomination. This film has, of course, now been adapted for the stage. Have you seen Once? I know that I am very late to the party on this one. Did you love this film as much as me? I’d love to know what you think about it - do leave me a comment in the box below!